Teen-targeted clothes that look great on moms too! There are definitely some teen trends that moms should avoid (no booty shorts, please!) -- but these five trends for teens look great on us, too! Style Evangelist Shaunya Hartley of Shop, Eat and Sleep has pulled together five trendy looks that work for young and, er, young-at-heart alike! "Your daughter pairs her white jeans with a vintage tee, and you can complement your denim with a great summer blazer," suggests Hartley. We like The Rockstar super skinny jeans (in marshmallow white) from Old Navy. These classic five-pocket denim leggings have just enough stretch -- you can move and the jeans won't lose their shape. In regular, petite and tall sizes at OldNavy.com, $35. Tip^ If you're not the skinny jeans type, try white denim in a skirt, bermudas or capris. 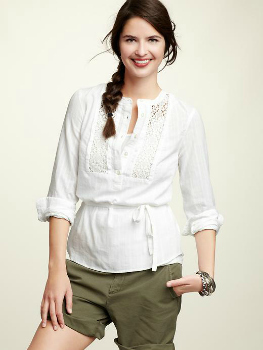 How gorgeous is this embroidered crochet-trim tunic? The 100 percent cotton in milk white gives a breezy look that looks great with cargo shorts or, as Hartley suggests, with cigarette pants. Your teen will love wearing this with hot pants and flirty flip-flops. Make this your most romantic piece of the season at Gap.com for just $25 (regularly $60). Tip^ Want to make a real statement? Choose a tribal-inspired tunic to pair with your white denim above! What would we do without the maxi dress? For moms, it's the go-to item for everything from shopping to date night. We can pair ours with a cardigan and great heels, while our daughters go Boho-chic with flats and fab jewelry. For lunch with your BFF, check out Old Navy's tie-waist tube maxi dress. The rayon dress features an elasticized tube neckline and empire waist. Sizes run XS - XXL in blue or orange print. Just $28 at OldNavy.com. For date night with the hubby, we love this tiered-ruffle satin maxi dress. The multi-floral print is so feminine and would look gorgeous with a little shrug. Add a pair of pretty canvas wedges to complement the ankle length of the dress. Reasonably priced ($23) at OldNavy.com. Tip^ For your beachside maxi dress, choose 100 percent cotton. "Your daughter can pull off a denim jacket with just about anything," says Hartley. Wear yours with linen slacks or over your maxi dress (above) to take off the chill. Choose a denim jacket with classic styling and trendy details. A slightly longer length features petites, regular and tall sizes, from XS - XXL. 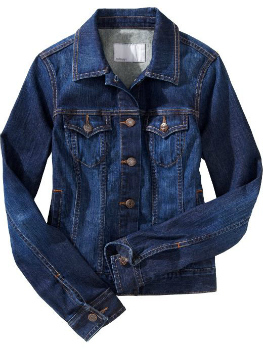 We like the dark worn jean jacket at OldNavy.com, $35. Tip^ Keep things light and summery with a jean jacket in white denim. When it comes to accessories, there are no age restrictions! Take shades, for example: You can wear the exact same uber-cool pair your daughter picks! 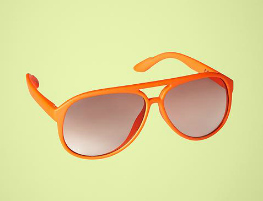 Get the season's hottest color (bright mandarin) in the coolest shape (aviators!) for just $10 from Gap. And wear them with everything! Swimsuit style: Teeny bikini or modest mom?